In addition to delivering propane, Northwest also designs and installs bulk propane storage systems to meet your custom needs. We offer sizes anywhere from 100-gallon to 90,000-gallon tanks. Need help designing and choosing a bulk propane storage system for your project or business? Let our design team provide a free consultation to help you make the right decision the first time. At Northwest, we don’t just deliver propane, we deliver service! Medium- to large-sized homes standardly have propane tanks of 420 pounds. This size tank can heat the entire house, running the hot water, dryer, fireplace, generators, and even the heated pool. For a commercial property, the same size tank can operate the heating, commercial cooking equipment, dry cleaning, and more. This tank is approximately 4-feet tall by 3-feet in diameter, and will comfortably hold 100 gallons when filled to 80% its maximum capacity. If you’re expecting a severe winter, a large storage tank will ensure you have the appropriate amount of propane for heating and running appliances. At Northwest Propane, we work with large storage tanks daily. We know how important they are to homeowners in need, and we can help you, too! 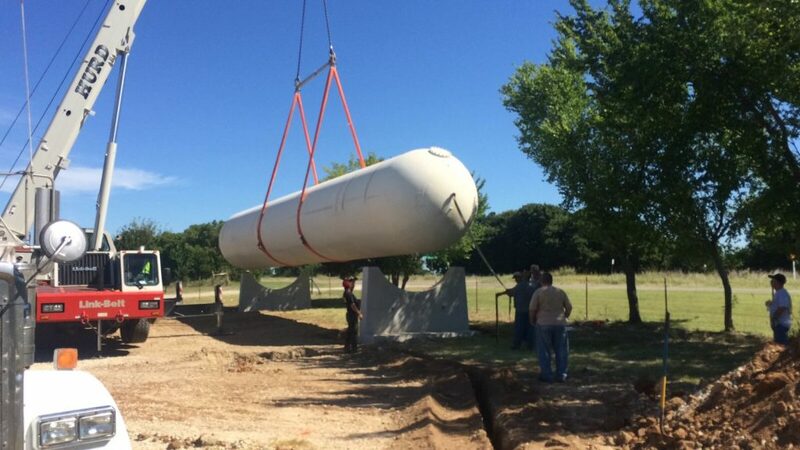 At Northwest Propane, we offer several residential propane tank sizes to meet your ever-changing needs. Whether you’re stocking up for the winter or simply have various appliances and heating applications to run, we’ve got you covered. Propane tanks are filled to approximately 80% of their total capacity to allow for expansion inside. If you fill your residential bulk propane tank, you will have more than enough in stock to heat your whole home. We need to consider several safety requirements when we place a bulk propane tank such as a 500-gallon tank. For instance, the container must be located at least 10 feet from the building, with a minimum distance of 10 feet from the property line. The team at Northwest Propane can ensure that your tank is installed and filled in accordance with all state and safety guidelines. For more information about our bulk propane design services and customized storage solutions, contact Northwest Propane today. Call 972-247-6121 for details.